Trying to find the correct replacement cartridge for your swimming pool or spa can be quite confusing. Filter cartridges come in a vast array of sizes, and the tops and bottoms of cartridges come in a variety of configurations. Our goal is to make it as easy as possible for you to determine the right filter cartridge for your particular swimming pool or spa. We currently offer filter cartridges for more than 1,500 pool and spa filter models, so you're sure to find what you need here. 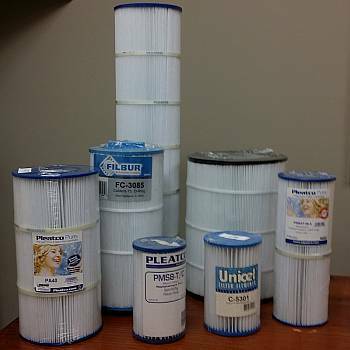 If you already know your filter cartridge's part number or the Unicel, Pleatco, or Filber replacement number, you can use the search box at the top right on this page (above our phone number) to quickly locate your cartridge. Or, you can follow one of the manufacturer's links below for a list of replacement cartridges for filters made by that manufacturer. Before making your final filter cartridge selection, double check the cartridge dimensions against the one that you wish to replace. If you have any questions or concerns about the cartridges, or if you are having difficulty identifying the type of cartridge you need, please don't hesitate to email us or give us a call. We'll get you an answer quickly. Easy steps for cleaning your filter cartridge can be found on our Filter Cartridge Cleaning Instructions page.